Indicating type covers will change colour in those areas with “triggering” reagents. Please find a list below containing some of the reagents and their effect on the valve and flange covers and guards. The colour change occurs on the inside of the cover, but will also be visible on the outside. Reagent concentration will affect the time and colour change. The colour of the untriggered cover is international orange. For those reagents not listed, we will be happy to supply a sample of indicating material for you to test and evaluate. 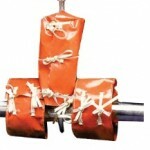 Flange Guards provide a visible indication of leakage. A colour change triggered only from the inside by a leak enables even untrained employees to see that a leak has occurred. Even a single drop of acid will bleach the inside coating; an outside spray will not affect the colour. Visible from a distance, the colour change hastens discovery and reduces damage. Everyone, in effect, becomes an inspector. 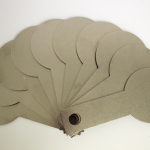 If leakage does occur—whether drops, spray or stream— our flange guards deflect it from spraying adjacent areas and personnel. All models of valve and flange covers are fully-indicating (meaning the actual material changes colour) except Teflon flange covers which indicate through a patch, and Teflon valve covers. Spade gaskets are used in the pipeline during shutdowns or cleaning operations. They allow safe maintenance by creating a positive shut off with in equipment or a pipeline. Teschem supplies both stainless steel and PTFE spade gaskets. PTFE Spectacle blinds are a more permanent form of a spade gasket, designed to be left installed within the pipeline. PTFE Spectacle blinds consist of a ring/spacer and a plate/spade. In the event of an item of equipment being shut down, the plate covers the ring to form an airtight seal. Our spectacle blinds ensure that an item of equipment can be securely blanked off, with no possibility of leakage in the valve. PTFE stands for PolyTetraFluoroEthylene, it is a fluorocarbon-based polymer. PTFE is a self-lubricating material that provides a low friction coefficient, and is ideally suited for the manufacture of corrosion-resistant gaskets & seals. 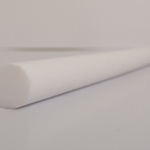 PTFE Sheets & Rods exhibit astonishing chemical resistance. PTFE was the first fluorocarbon. It is the most chemically resistant plastic known. Mechanical properties can be improved by the addition of fillers such as glass fibre, carbon, graphite, molybdenum disulphide and bronze. Only a few chemicals react with it. It has low mechanical properties compared to other engineering plastics. PTFE’s properties remain useful over a temperature range of -400 to 500°F (-240 to 260°C). PTFE has excellent thermal and electrical insulation properties. It also has a low coefficient of friction. The Teflon® brand of PTFE is resin manufactured only by DuPont. Several other manufacturers make their own brands of PTFE which can often be used as substitute material. We offers various brands of PTFE including Teflon®, Dyneon and Daiken, but mechanical PTFE (as sold here) is a reprocessed grade that may contain a variety of brands in the overall blend. The mechanical properties and purity of Mechanical Grade PTFE may also be lower than Virgin Grade PTFE. Mechanical Grade PTFE is supplied without warrantee or any guarantees regarding minimal properties. Customers requiring material certifications and traceability should consider VIRGIN PTFE made from Dyneon or Daiken resins, or DuPont Teflon® specialty grades such as Teflon 7A, Teflon 7C, Teflon 8A or Teflon 9B – Teflon® specialty grades are available as a custom order only and are priced higher than Generic Virgin PTFE Shapes – Lead-Time Will Apply. Teschem are a trusted supplier of O-ring products that provide high-performance in extreme conditions, with changing exposures to chemicals, pressures and temperatures. Extensive stocks are held at our Cork facility, enabling next day delivery on most sizes and materials. 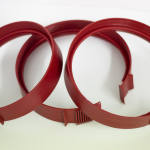 Teschem can supply thousands of different sizes of rubber O-rings in the majority of materials, such as Nitrile and FKM (Viton®), “exotic” compounds such as Aflas®, HNBR, Perfluorelastomer and FEP encapsulated O Rings at very competitive prices. 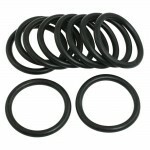 We can supply any standard or non-standard size rubber O-rings (ranging from 2mm ID to 4 metres OD), in any material. Teschem offers a wide range of standard O-ring products, in both imperial and metric sizes and standard cross-sections. We also stock O-ring kits and encapsulated O-rings for maximum sealing capability.